SEBRING, Fla. - Corvette Racing's new Corvette C6.Rs qualified third and fourth in the GT1 class for Saturday's Mobil 1 Twelve Hours of Sebring, the season-opening round of the 10-race American Le Mans Series. Reigning GT1 co-champion Oliver Gavin turned the third quickest time in the No. 4 Compuware Corvette at 1:56.770 (114.070 mph) and three-time Sebring winner Ron Fellows was fourth fastest at 1:57.854 (113.021 mph) in the No. 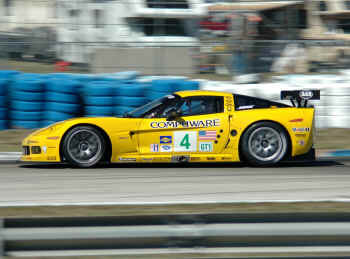 3 Compuware Corvette. "It's unfortunate that qualifying was cut short because we had three more hot laps that we were going to put on the tires before the start of the race," said Corvette Racing program manager Doug Fehan. "The red flag came out just at the wrong time, as it often seems to do in racing." "Last year we qualified on the pole and we didn't do that this year - no excuses," Fehan commented. "The lap times have been close throughout the practice and qualifying sessions. I give the sanctioning body high marks for being able to balance the performance differential between the Corvette and the Aston Martin." "We ran as hard as we could and that was the best we could produce," said the Briton, who qualified his yellow Corvette C6.R 14th overall. "The lap times were coming down and perhaps we could have run a bit quicker had the red flag not come out. It's just one of those things." Traffic was a factor for Fellows: "I caught traffic four times in two laps, and then the red flag came out," the Canadian reported. "We just didn't get an opportunity to get a good one. The track did seem slippery, and that's something we'll have to address in the race to make sure that we have enough grip." "Sebring is an unusual place because it changes from hour to hour," Fehan noted. "We know that when it gets hot, it's going to get slippery, and there will be a lot of cars on the track. That's why Corvette Racing focuses very hard on developing a setup that will perform well in a wide variety of conditions. We've spent the majority of our track time this week working on that."